we have a working kitchen now! i took these photos right after the fitter left, so you can still see the sawdust. 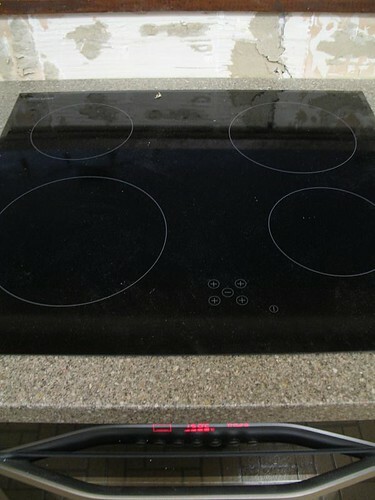 it wasn't easy to get good pictures of the cooktop or oven, but they're nice... so sleek and modern! did you notice the buttons? they were a definite factor in our decision. 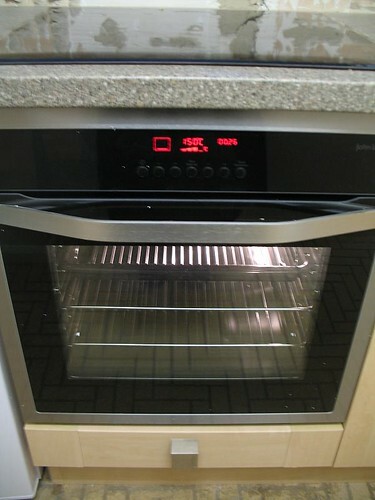 the oven is a combi convection/conventional oven and it's self-cleaning. hurrah! 2. two of the upper cabinet doors will be replaced due to nicks and scratches when they were delivered. grrr. i'm sure you have noticed the unfinished state of the former tiles. we knew that john lewis would not re-tile for us. however, we were led to believe that they would leave the walls slightly less ... holey? 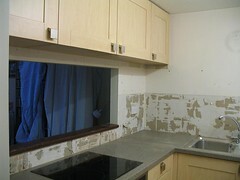 the fitter has agreed to re-plaster the really bad sections, but the rest is up to us. the planner made it sound like we would be able to sand and paint over those areas. 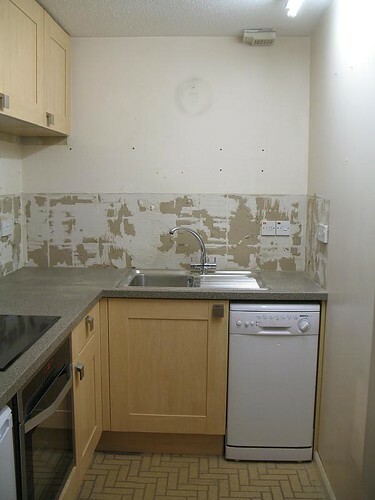 the fitter strongly suggests that we replace the tiles. so, another decision. we are having someone come to measure the floor on monday morning. our plan is to lay some simple vinyl. hopefully it can just be glued over the existing floor. i have been researching all kinds of wall racks, magnetic strips and hanging options for pots, pans, spices, utensils, paper towels, etc. aside from ikea, someone suggested lakeland. the nearest one appears to be at the opposite end of the northern line, but i'm willing to make the trek! question of the day: what should our first meal in the new kitchen be??? spaghetti and meatballs says aedredhead! Although still unfinished it looks oh so great. i'm sure you will be able to work out the minor glitches. any major ones will be ok too. first meal??? anything that requires you to use the new oven, even in a "convenctional" way!